Whale sharks, the world’s largest living fish, live on plankton and are harmless to humans. Every year, between October and March, hundreds of the spotted giants pass near the island, giving residents an opportunity to attract tourists with whale shark tours. Many of the people on Mafia depend on fishing to make their living. Though the whale sharks aren’t caught to eat, de Villiers says they are targeted. Whale sharks are filter feeders and eat zooplankton, the same food as small fish, so they are often found in the same place. Larger fish go after those fish. Locals will often follow the whale sharks and place nets around them to get to the other fish. According to de Villiers, the sharks are then forced out of the nets, usually beaten with blunt objects but sometimes slashed and cut with knives. Mafia Island isn’t the only place where the sharks are under threat. According to the Shark Research Institute, poaching occurs in Mozambique, where large numbers gather off the coast. 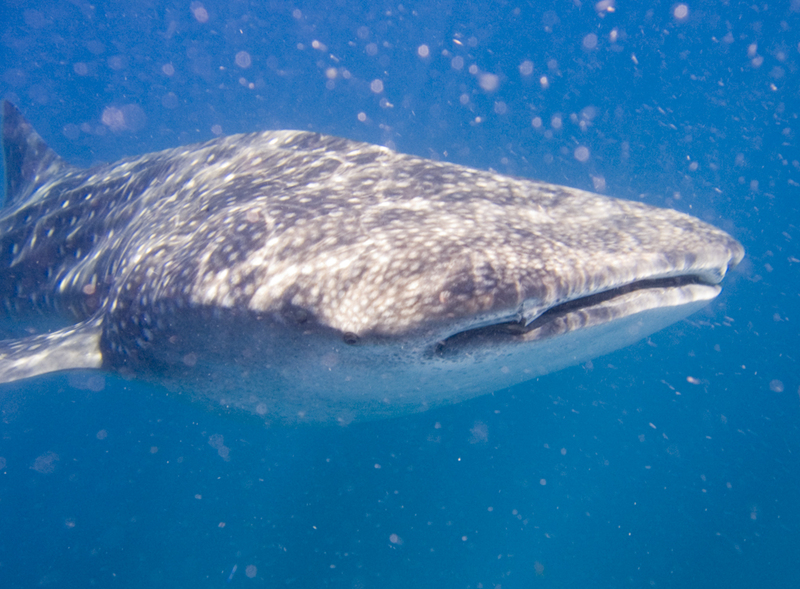 In addition, whale sharks, like other sharks, fall victim to floating gill nets and longline fishing. Often the valuable fins are removed, while the rest of the shark is thrown back in the water to die. In 2002 whale sharks were placed on Appendix II of the Convention on International Trade in Endangered Species (CITES), a United Nations Treaty Organization. The listing requires that member nations of CITES monitor international trade in whale shark products and ensure that trade does not threaten survival of the species. They’re also listed on Appendix II of the Convention on Migratory Species, also known as the Bonn Convention. Whale sharks are protected in some areas, including Honduras, India, Mexico, the Maldives, South Africa the Philippines, and along the eastern coast of the United States. Though he was key in getting WHASCOS off the ground, de Villiers, a biologist and dive master who owns one of the five resorts on Mafia, was pushed to establish the Society by others. “One of the local fishers, Libe Mokoki, has been trying to raise awareness about the whale sharks for some time and had badgered everyone on and off about the sharks and the need to do something to protect them,” de Villiers says. WHASCOS has continued this work, educating fishing villages about the giant sea creature and how it can benefit them. The Society is also working with an American shark research biologist to train monitors and tag the sharks, as well as collaborating with a number of other organizations, including the World Wildlife Fund (WWF), the local District Commissioner, and the Mafia Island Marine Park. Sylvester Kazimoto, the Society’s chairperson, is concerned about whale shark tours and the lack of direction around conduct during the tours. With the number of excursions still low, de Villiers believes there isn’t much of a problem yet. Collisions between boats and sharks are rare, and since both move at slow speeds, they tend to be minor. Still, he’d like to figure out how to avoid them completely. As WHASCOS continues to train tour operators, they in turn will show tourists how to approach whale sharks and everyone will benefit, including the fish.